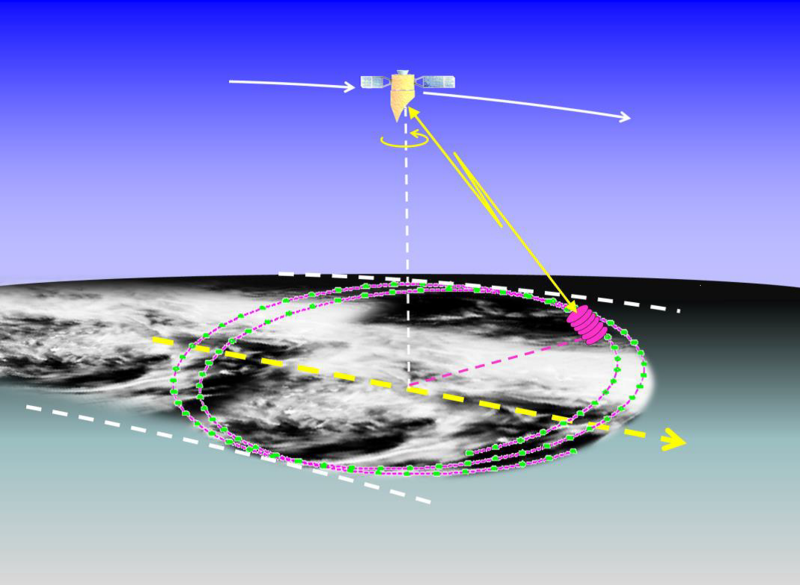 Building on recent ESA and CEOI studies, we propose a conically scanning spaceborne broad-swath Dopplerised 94GHz radar to provide global measurements of winds, rainfall and cloud ice water content using the radar returns from cloud and precipitation particles. The observations will have 50km horizontal and 1km vertical resolution with several visits every day at European latitudes. Windstorms in Europe caused £18.5B of damage in Europe in 1999, £1.5B in 2009 and £1.3B in 2010. High losses also result from flooding. The loss of life in tropical cyclones is decreasing due to improved forecasts and better warnings: compare the 138,000 deaths in Myanmar due to cyclone Nargis in 2008 with the 43 deaths from the more powerful Indian super-cyclone, Phailin, in October 2013. Better observations would lead to more accurate forecasts with improved timing and location so that mitigation activities can be better focussed. The in-cloud winds from this project would complement the clear air winds from the ESA explorer ADM/AEOLUS when it is launched in late 2014. The 94GHz (3mm) radar has a very narrow beam and so even with a slant path can achieve the 1km vertical resolution. The satellite will have the same 94GHz transmitter that has operated flawlessly for Cloudsat since its launch in 2006. The 2.9 by 1.8m elliptical antenna rotates once every seven seconds sweeping out a broad swath on the ground. The Doppler shift and rainfall rates will be derived using the returns from twin pulse pairs alternately polarised in the horizontal and vertical. We propose validation of this polarisation diversity technique with observations from with the recently upgraded 94GHz radar at Chilbolton, Hampshire. The ‘WIVERN’- WInd VElocity Radar Nephoscope – concept from a recent ESA study by Astrium, Starlab and the U of Reading.